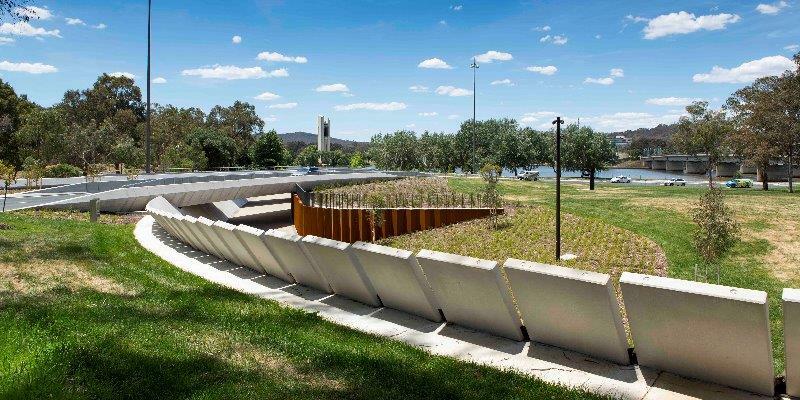 An award-winning underpass and shared pathway on the foreshore of Canberra’s Lake Burley Griffin has taken full advantage of concrete forms and construction methodologies to create an inspiring new landmark in the national capital. The Bowen Place pedestrian and cyclist crossing was designed by lahznimmo architects and Spackman Mossop Michaels, and chosen by a competition jury for the National Capital Authority. 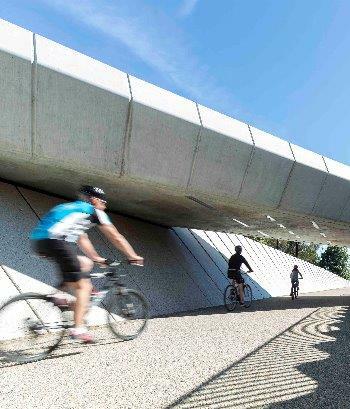 The shared pathway connects the walking and cycling track along the foreshore of Lake Burley Griffin to the Kings Avenue Bridge, underpassing the busy Bowen Drive. One of the challenges for the design team was negotiating the significant level change from the lakeside to the Kings Avenue Bridge. The solution was a long, curving concrete pathway with a 1:33 gradient rise – a solution that minimised the visual impact of the structure within the sensitive Parliamentary Zone, created long sight lines so pedestrian and cyclists could see each other, and eliminated the need for hand rails or rest areas that would otherwise be required for a shorter, steeper pathway. Indeed, from ground level the only visual evidence of the pathway is the exposed upper edges of the polished precast panels that define the elegant sweep of the structure. These 1200mm-wide precast panels provide the façade for a reinforced, shotcreted retaining wall that extends along the length of the pathway. The panels are fixed to the wall via threaded galvanises rods that allow for individual adjustment of the angle of each panel. The angling of the panels, in turn, creates a wonderful sense of lightness and space, particularly where the path passes under the new Bowen Place vehicle bridge. 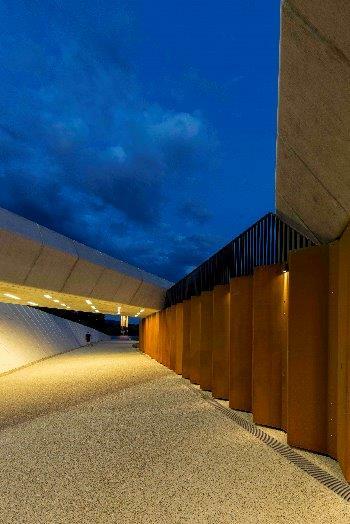 “When you think of a traditional underpass you think of tall, vertical retaining walls that create a typically dark, dank space,” says Andrew Nimmo, of lahznimmo architects. “Our approach was to try and open the space up as much as possible. So at the point where the path passes under Bowen Place, we’ve widened it out to six metres and leaned the precast panels at an angle of 45 degrees. The top of the panels rise above ground level to form a natural balustrade, adjoining an insitu concrete ‘lip’ that acts as a mowing strip. The gap between the panels also opens out from about 30mm at the base to a maximum of 115 mm at the top, creating a beautiful shading effect. Because the panels vary in height to adjust for the rising gradient, precasting came into its own. “To take full advantage of the efficiency of precasting, you use a mould and repeat the process. In this case, we simply used a shutter at one end of the mould to adjust the lengths of each panel,” Andrew says. The precast concrete mix included a white cement, together with quartz and a spectrum of dark coloured stones that are exposed through the polishing process. A sacrificial anti-graffiti coating was applied to the exposed side of each panel. The path itself is insitu concrete with an acid-etched finish that creates a textural contrast to the walls. A ‘crumpled’ ochre-coloured vertical steel wall on the inner side of the pathway, directly under the overpass bridge, adds yet another textural dimension to the project. The vehicle overpass was also part of the design brief. It is constructed from post-tensioned, off-form concrete. The bridge parapet is, in fact, the main structural beam, with the distinctive edge formed up by steel V-shaped forms. “The raw, off-form concrete surface is a nice contrast to the bright ochre of the steel and the polished surface of the precast panels below,” Andrew says. 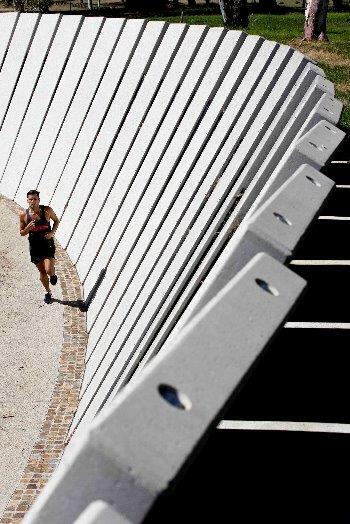 In true Canberra fashion, the Bowen Place pedestrian and cyclist crossing also complements and showcases one of the city’s most distinctive pieces of architecture – the Carillion, which is in direct line of sight from each end of the pathway. It’s a fitting vista from a project that, in its own distinctive way, adds to the unique architectural palette of our national capital.